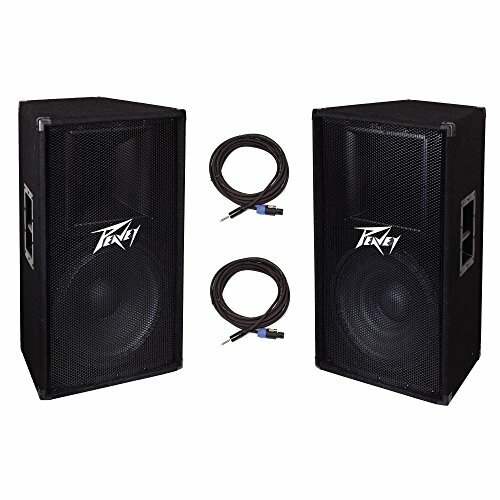 Peavey 2-Way 15'' 800W Passive PA DJ Sound Speaker (2) + 25' Speaker Cable (2) by Peavey at IGWT. MPN: 2 x PV-115 + 2 x PV-25SC. Hurry! Limited time offer. Offer valid only while supplies last. Yeah, your live music setup is dope, but it could be even more awesome when you add this Peavey PV 115 15-Inch 2-Way Live Sound Speaker to your rig. Yeah, your live music setup is dope, but it could be even more awesome when you add this Peavey PV 115 15-Inch 2-Way Live Sound Speaker to your rig. This 2-way sound reinforcement enclosure is what you have been missing. It has a 15-inch heavy-duty woofer, a titanium diaphragm compression driver, dynamic tweeter protection, and a crossover network that will blow your mind. It boasts 400 watts of RMS power and 800 watts of peak power handling with a lightweight trapezoidal enclosure and high-quality, rugged carpeting with steel handles and corners. This speaker also has a full-length steel grille, a 90 by 40-degree coverage constant directivity horn, and T-nut mounting. Hook up your speaker to this Peavey PV Series 25-Foot Speaker Cable and watch the magic happen. This is a 2 conductor, 14-gauge cable with NL2FC to 0.25-inch connectors so you can blast your speaker and know that it is connected with professional durability and reliability.